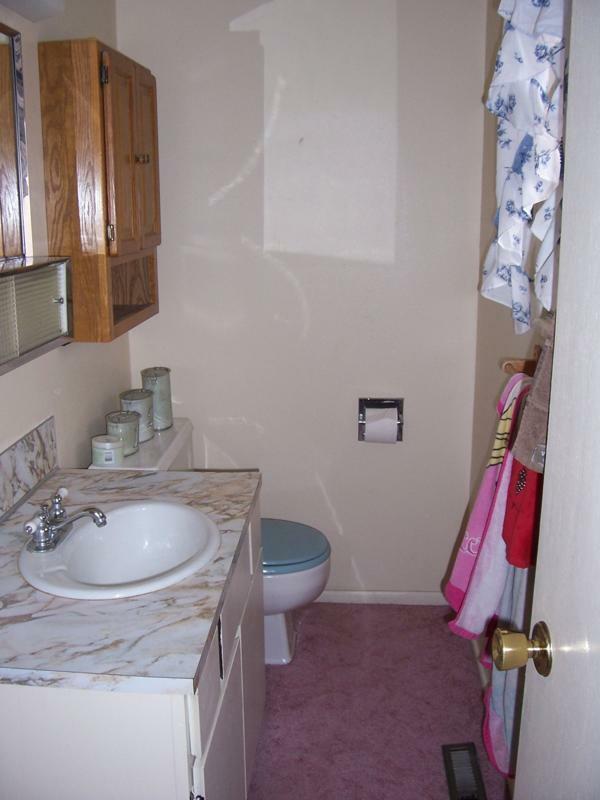 In 2008-2009 the average cost of a mid-range bathroom remodel was $15,899 — with 25% of that *investment* immediately lost. 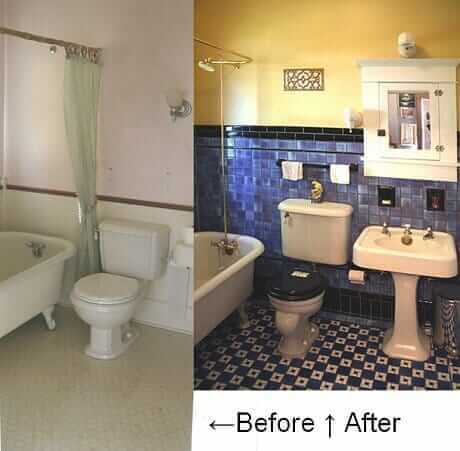 Yes, according to the annual Hanley-Wood Remodeling survey, the “return” on a bathroom remodel is about 75%. But realize, homeowners, that means — the paint has dried — and you just LOST $4,000. Of course, you get to enjoy any updates… but don’t kid yourself, this likely is not a particularly wise *investment* in the sense we generally expect/discuss when we use that term. Moreover, I have read elsewhere that the 75% “return” indicated occurs if/when sell your house immediately… if you sell your home many years later, that bathroom reno likely will be “worth” even less, because by then, the next homeowners will think it is tired and yes, dated. I don’t mean to be a debbie downer, instead, a practical pam. 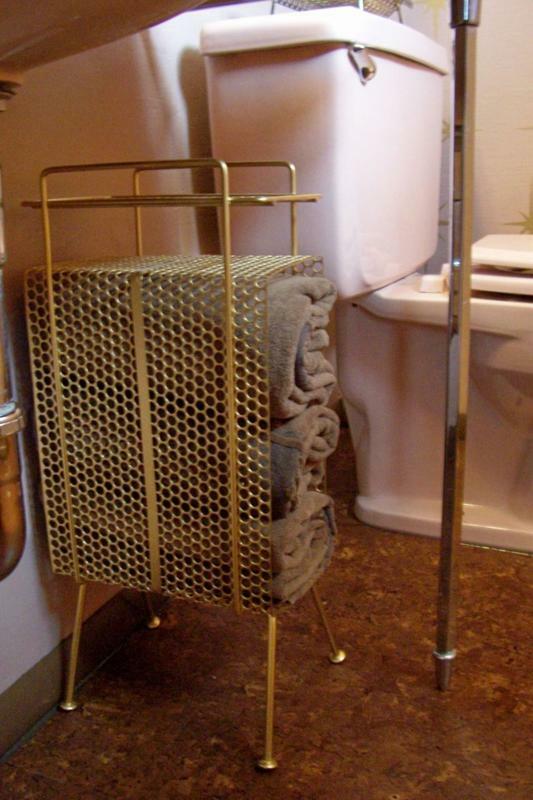 And practical pam suggests: *Invest* your renovation dollars wisely, which I think starts with trying first to love the bathroom you’re in. 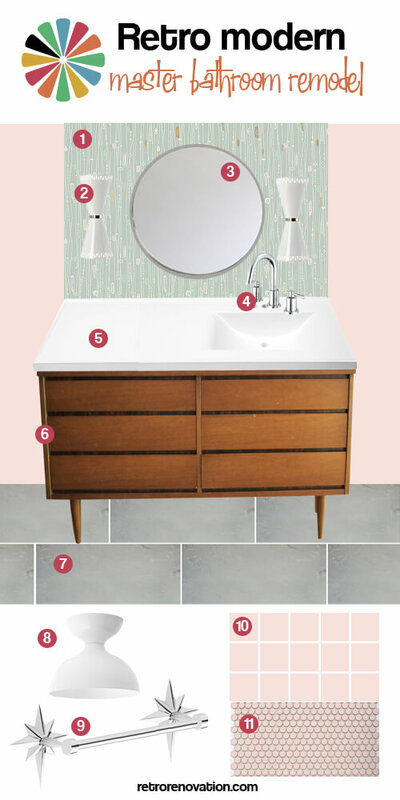 If it has basically good bones, work with them … keep those mid-century tiles… shop surplus and vintage for new/old fixtures… save a bundle … and *invest* your money in… well, that’s a different blog altogether. 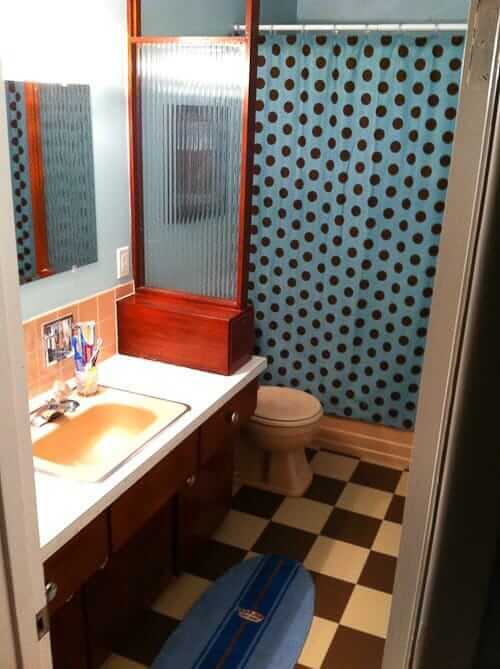 Today: Karen kept her her pink speckled tiled shower but turned the rest of her kinda blah 1968 bathroom into a vintage delight for $708. 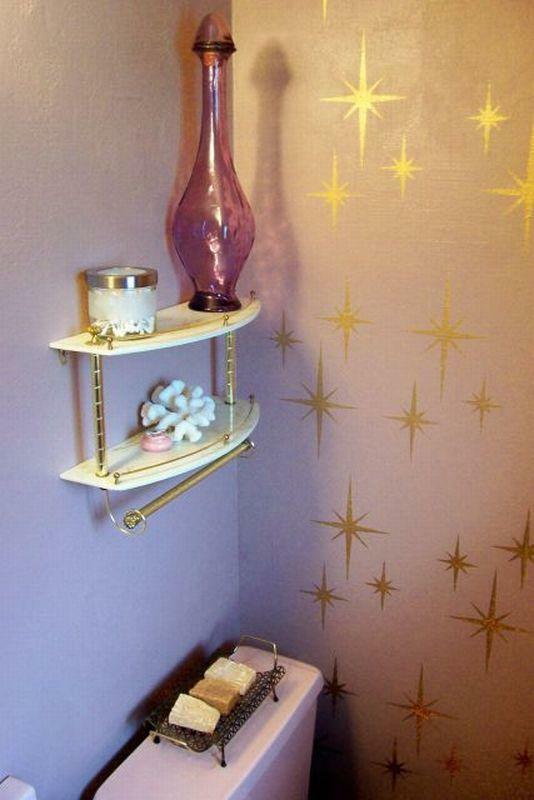 She got a lot of bang for her buck — a bathroom dated to suit her home — and what fun. Hi Pam. My husband and I have recently purchased our first home: a 1968 split level in a beautiful town. I just finished my first of maaaaany projects that need to be done to this house. Unfortunately it has not been taken care of that well. The first project I tackled was our tiny master bathroom. As you can see it was horrible. 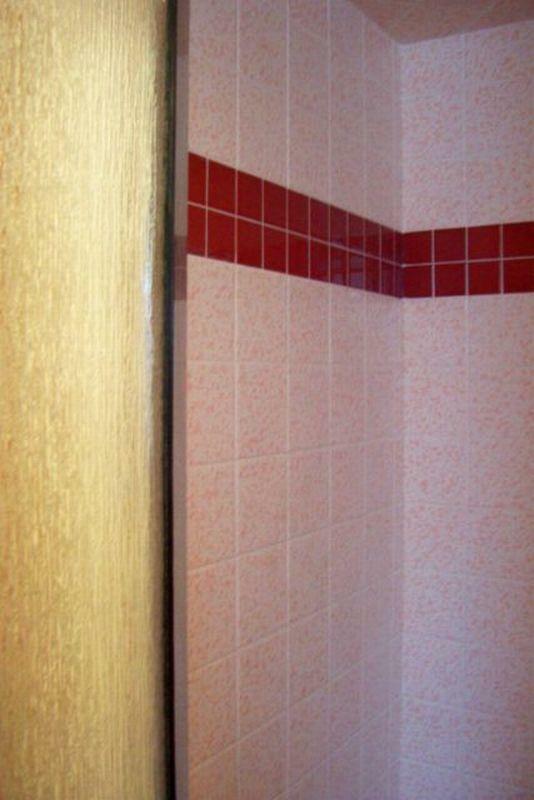 I knew I wanted to add pink fixtures to match the speckled pink shower. The first ones I purchased, which I drove 100 miles to buy, ended up being worthless because I later found a crack in the pink toilet. Ugh! 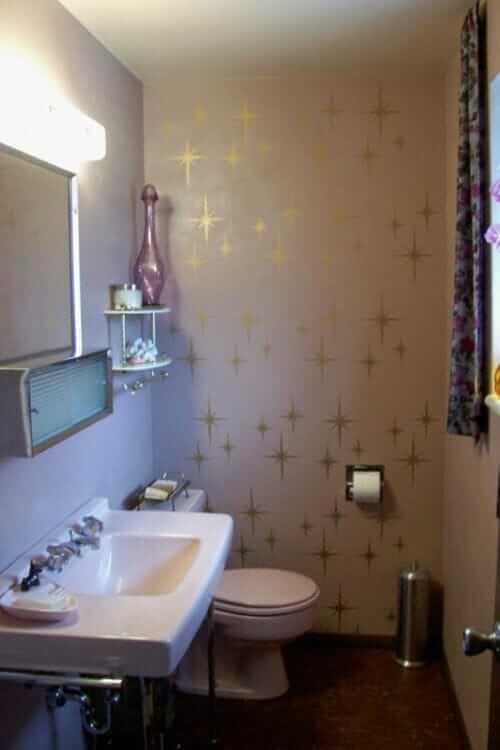 But the decorating Gods were smiling on me (or felt sorry for me) and I found a peachy pink toilet, which ended up matching the tile better than the previous purchase. Then, later that day I went to a nearby architectural salvage. At the very end of the long, winding maze through the bathroom graveyard I found this gorgeous console sink in the exact shade as the toilet. I couldn’t believe it!!! When I started, the walls had this terrible orange peel finish, so I re-textured it in sort of a crosshatch pattern. There was carpet on the floor, YUCK! The subfloor had been “repaired” terribly, so that had to be fixed. The paint I used was Behr paint and primer in one (love the instant results) in a satin finish. The color on the walls is Martha Stewart Colors in Smoke Bush Rose. I have not found another color like it. The best way to describe it is to take neopolitan ice cream and mix it together until the colors are blended. I know this because that’s how I love to eat neopolitan: mixed up, which I did when I took a break from painting this bathroom…. weird. The ceiling color is the same as the fixtures. The flooring is a floating, resilient, faux cork by Traffic Master Allure. Super easy to install with no glue and I special ordered it from Home Depot. It was $1.99 a square foot. They have a lighter shade I may use in my kitchen later. 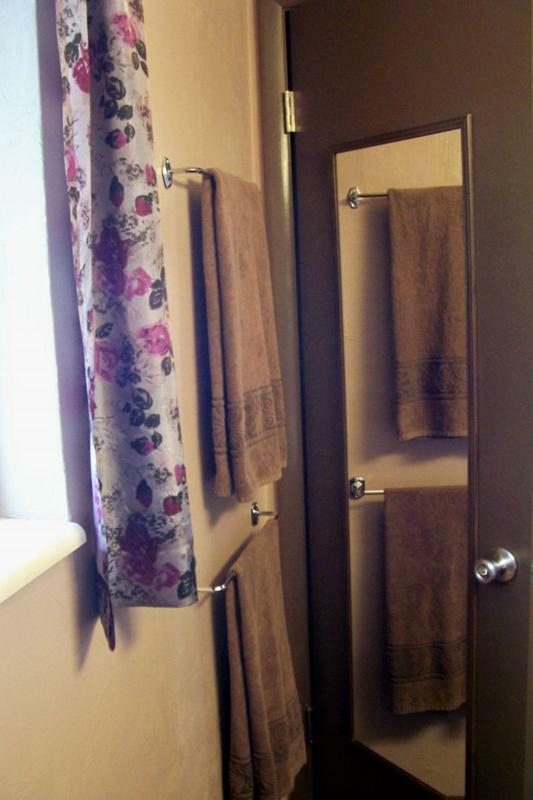 The curtains are from vintage dress fabric purchased at the local thrift store, as well as the tray on the back of the toilet, the light fixture, the two bottles, the shelf over the toilet, and the towel bars, all for $15! The pink scottie dog ash tray that I’m using as a soap dish was purchased at a local antique store for $6. The vanity mirror, door mirror, and recessed paper holder were already in the house. 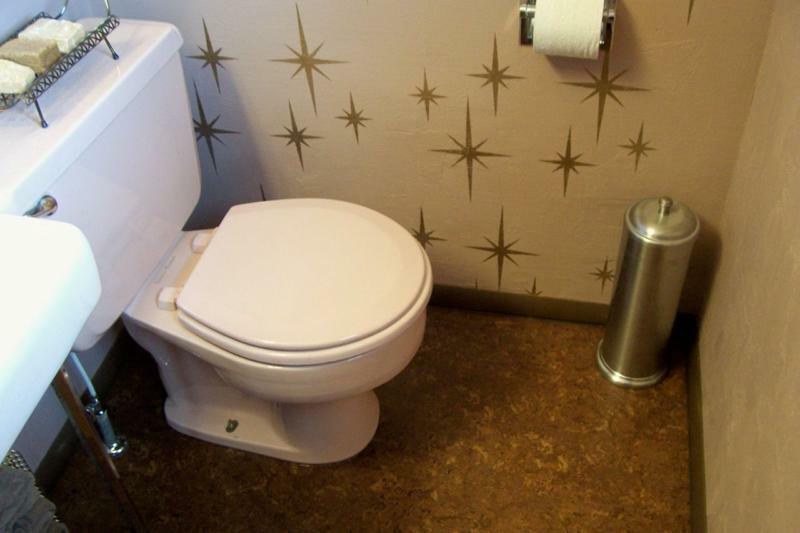 So total I spent $175 on fixtures, $75 on flooring, $15 on plaster for the walls, $20 for the “make your own stencil kit” and paint for the starburst design. Of course I recaulked around the window, toilet and baseboard, and I also recaulked the shower. This cost about $20. I also bought a grout paint pen (my new best friend) for $7.50. I spent about $25 on baseboards. Paint stripper and tape, etc. 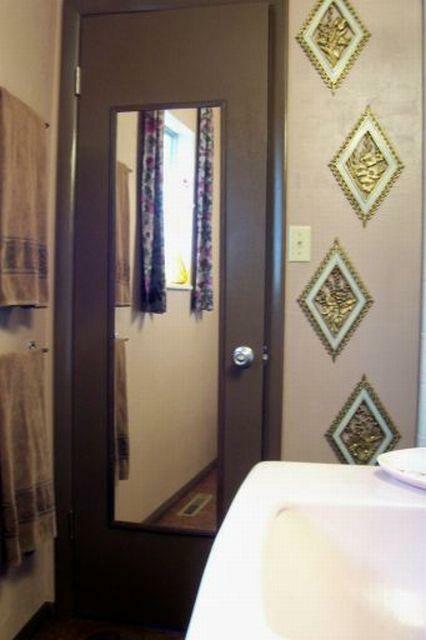 I probably spent about $75 on to refinish the door. 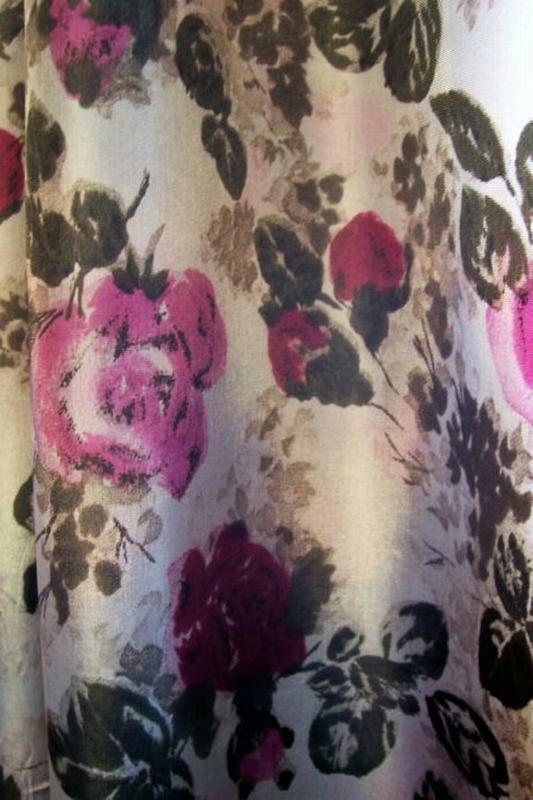 For the paint I spent about $100, althought I will use the pink and brown in other rooms, too. The curtain rod and toilet paper holder were about $20. I had a wonderful plumber that installed the fixtures for about $175. This was money well spent. I did not want my husband to install them because at our last house he overtightened the bolts for our yellow toilet and it cracked! If he cracked this set it would have been grounds for divorce, so I saved us the headaches and legal fees and hired a plumber. By the way, these sinks need special brackets and a sturdy wall to install them on, which our plumber hunted down for me. Karen — I LOVE the bathroom, great job, girl power! 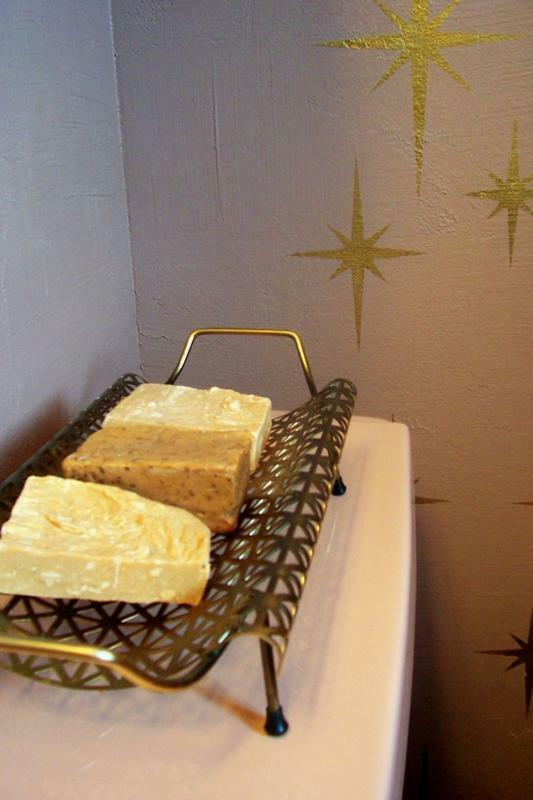 I especially think your stenciling is a great idea that many folks will jump right on. 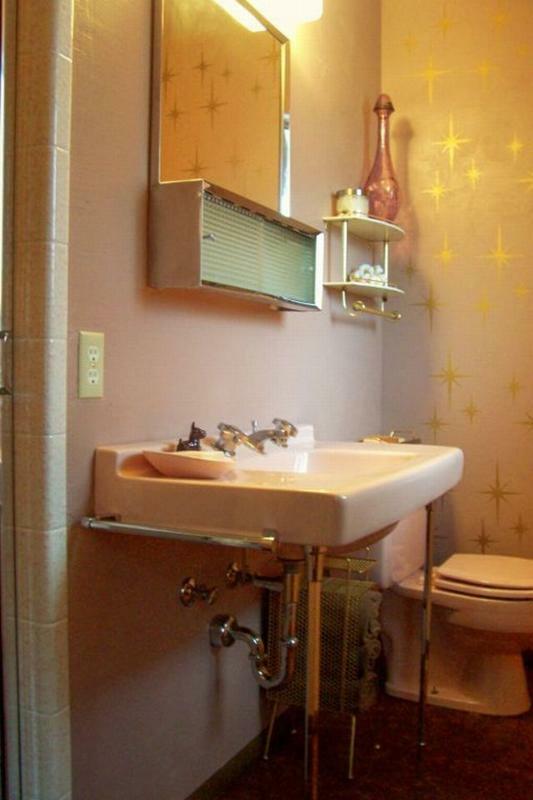 The sink is fabulous… the floor is terrific… and all the little details: well, you put them together perfectly. 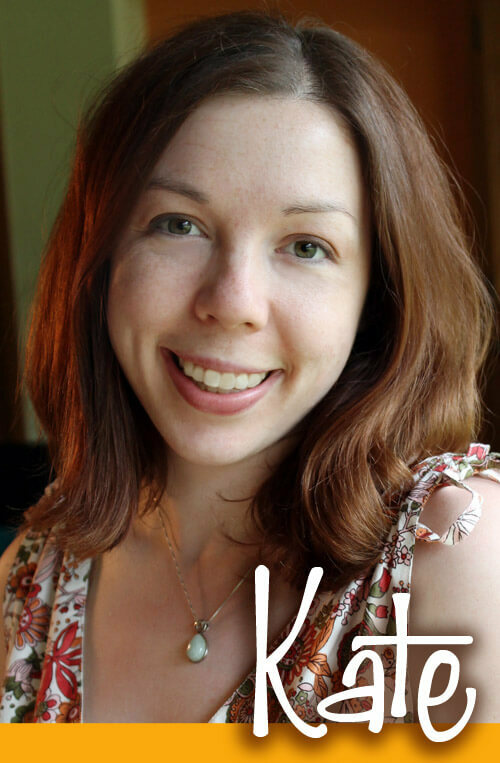 I can’t wait to see more of your home renovation story unfold. Many thanks for taking the time to share this with us all. 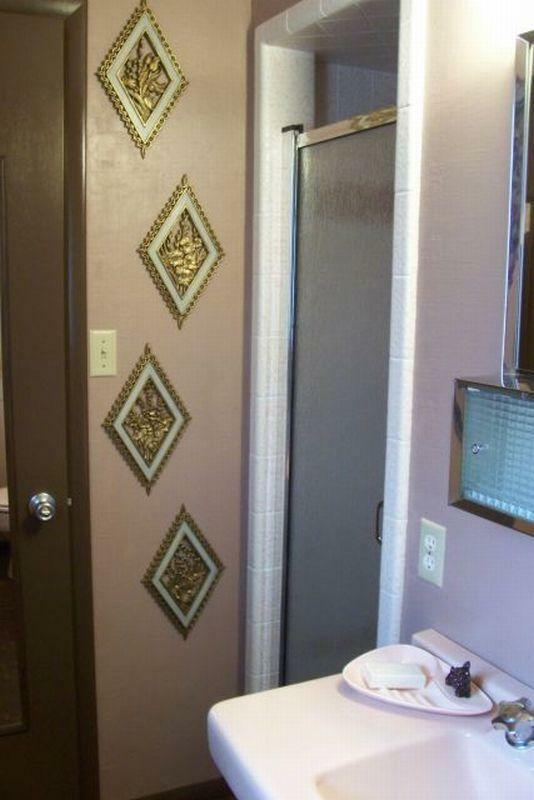 I love this bathroom! 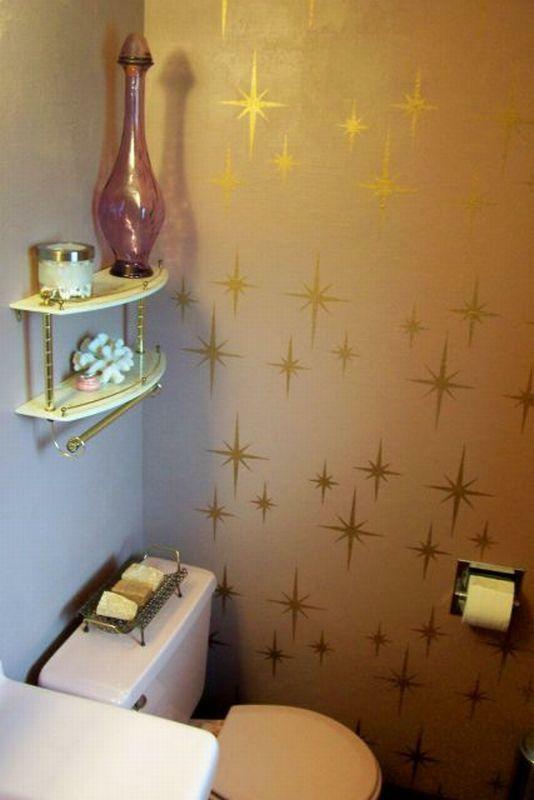 The wall decor is exactly what I want to do. 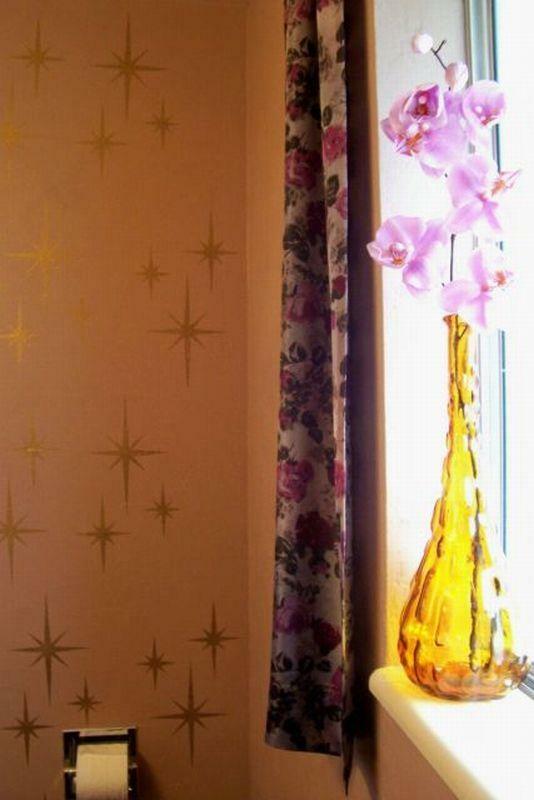 Did you use stencils for the gold stars? Where did you get them? I’m so jealous of your poodle soap dish — cute! 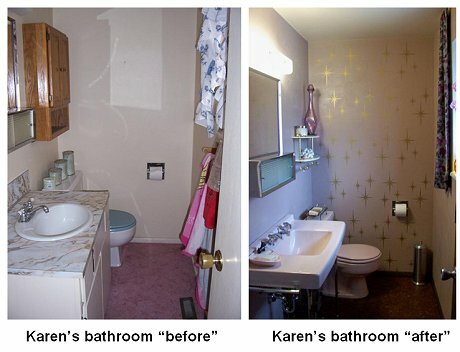 Karen: I am very excited about your bathroom! It turned out wonderful, congrats! I would love to know more about those starburst patterns you did, can you buy them, or would you lend me just one 🙂 tks! Opps, new to the website and I will read up further! Thks!!! 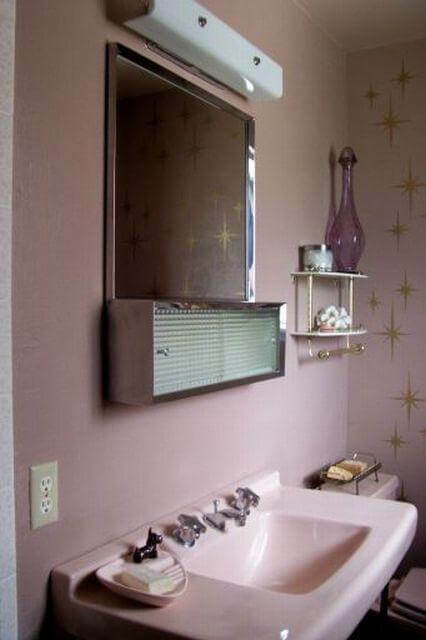 I have a question about the beautiful sink. I have two similar ones in my ~1900 home and I need to replace the faucets which are in terrible shape. I don’t know where to find replacement faucet sets that will fit on the sloping sink panel. Did your sink come with faucets or did you find some new ones that worked with the old sink? LOVE that you had the vision, used what you had, found things to go perfectly with the rest, and saved a ton of money! Well done!